Formed in 1836 from Lewis, Kanawha, and Nicholas. 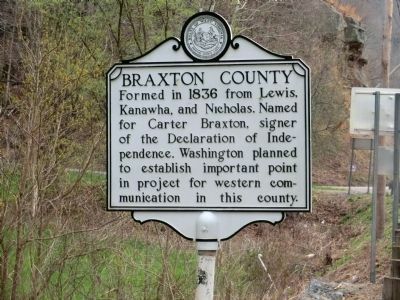 Named for Carter Braxton, signer of the Declaration of Independence. Washington planned to establish important point in project for western communication in this county. Formed in 1845 from Kanawha and Lewis. 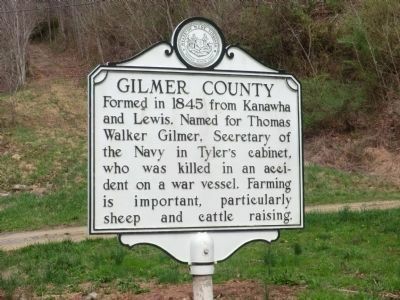 Named for Thomas Walker Gilmer, Secretary of the Navy in Tyler's cabinet, who was killed in an accident on a war vessel. Farming is important, particularly sheep and cattle raising. Location. 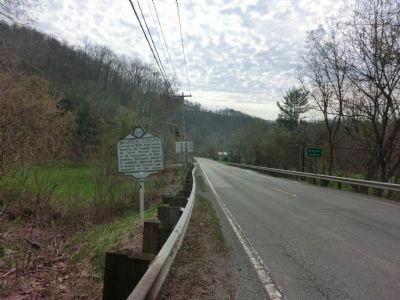 38° 52.602′ N, 80° 42.264′ W. Marker is in Burnsville, West Virginia, in Braxton County. Marker is on Burnsville Road (SR 5). Touch for map. 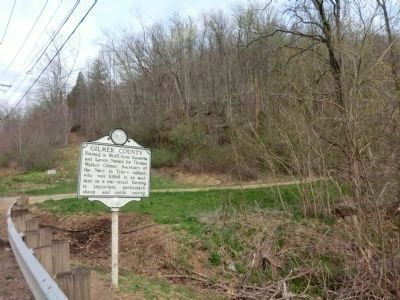 Marker is in this post office area: Burnsville WV 26335, United States of America. Touch for directions. Other nearby markers. At least 8 other markers are within 8 miles of this marker, measured as the crow flies. Town of Burnsville (approx. 2.6 miles away); Duck Run Cable Suspension Bridge (approx. 5.8 miles away); Samuel Lewis Hays (approx. 7.6 miles away); Glenville State Teachers College (approx. 8 miles away); Attack on Glenville (approx. 8.1 miles away); Fort Moore (approx. 8.1 miles away); Glenville (approx. 8.1 miles away); Glenville State College (approx. 8.1 miles away). More. Search the internet for Braxton County/Gilmore County. Credits. This page was last revised on June 16, 2016. This page originally submitted on May 4, 2014, by Don Morfe of Baltimore, Maryland. This page has been viewed 449 times since then and 7 times this year. Photos: 1, 2, 3, 4. submitted on May 4, 2014, by Don Morfe of Baltimore, Maryland. • Bill Pfingsten was the editor who published this page.